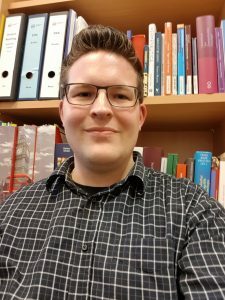 Christopher Nunn is a church historian at the University of Heidelberg, where he is writing a PhD thesis about women in St. Augustine’s correspondence. He’s trained in theology and latin philology and is particularly interested in patristics, intertextuality, narratology, gender studies and stylometrics as well as in the epistemology and pedagogy of Digital Humanities. He organized the program of the 1st Summerschool of Digital Humanities in Heidelberg on Distant Reading and was one of the founders of InFoDiTex, the Interdisciplinary Forum of Digital Textual Sciences, where he regularly blogs, tweets and informs about DH-related themes. Besides, he’s part of a project about digital methods in religious teaching and created the Augustinian Correspondence Database.